­­Not long ago, Kiara Blue found herself at a precipitous crossroads. She had always dreamed of a career in technology, but as a young woman of color, she felt isolated among fellow students who didn’t look like her, and she didn’t see how she’d ever be able to repay the cost of college. Microsoft’s trailblazing Employee Giving Program has helped transform the lives of people like Blue, whose hopelessness ended when she found Year Up. The organization seeks to bring low-income young adults out of poverty and into a professional career in a single year — and it’s one of more than 31,000 nonprofits that Microsoft employees have supported since 1983. Microsoft matches each employee’s donations to nonprofits and contributes $25 for every hour an employee volunteers. The program has brought more than $1 billion to nonprofits’ efforts to help people around the globe and raised a record-setting $125 million last year alone. “Fostering employee giving is a great source of employee pride and morale, and it’s one way our employees can personally contribute to our mission to empower every person and every organization on the planet to achieve more,” says Mary Snapp, a corporate vice president and head of Microsoft Philanthropies. The Employee Giving Program and other efforts by Microsoft Philanthropies “invest our greatest assets — our people, technology, grants and voice — to advance a future that is for everyone, where the benefits of technology, and the opportunities it can open, reach those who need it most,” Snapp says. Part of what changed Blue’s troubled trajectory was Jacky Wright, Microsoft’s Seattle-based vice president of IT Strategic Services. Wright serves on the board of Year Up Puget Sound in Washington state and mentored Blue as the young woman worked her way through the program. Wright says when she was younger, she never realized she could pursue a career in technology; she “fell into computer science” after spending years in school without any exposure to it at all. “Now, the ability for me to be a role model, to move the dial and expose young adults to this world — possibly one that could lead to rich careers that are a way out for people born less fortunate — that is really important to me,” she says. Year Up, a nonprofit supported by individual employees through the Microsoft Employee Giving Program as well as Microsoft Philanthropies, provides low-income young people a year of professional skills training, internships and other development opportunities. These young people receive a stipend that allows them to focus on the program without having to work in a full-time job on top of it. Wright has helped many of them land jobs, increasing diversity in corporate ranks. About 80 Year Up participants intern at Microsoft each year, and Wright hopes to see that number soon reach 200. Blue, who says she was raised in “one of those towns you pass through to get to something better,” is grateful for the help she received from Wright and Year Up. She landed a Microsoft internship working for Xbox and is now a risk analyst at Expedia. Just over 2000 miles away, Kevin Sheck is leading another effort to help close diversity gaps and inequities in the technology industry. A St. Louis-based technical account manager of Premier Support, the 16-year Microsoft veteran not only volunteers between 500 and 800 hours per year, he also maximizes the company’s match on donations, directing $15,000 to a youth program he helped create. The moment was just one of the many ways the thousands of nonprofits that benefit from the Employee Giving Program are making a difference in the world, doing everything from providing shelter and helping international refugees to protecting forests. On the surface, Sheck and Wright may seem to have little in common with Anne Disabato — with the exception of their place of employment. A Seattle-based technical account manager, she joined Microsoft out of college, relocating from Chicago, and has been with the company for two years. 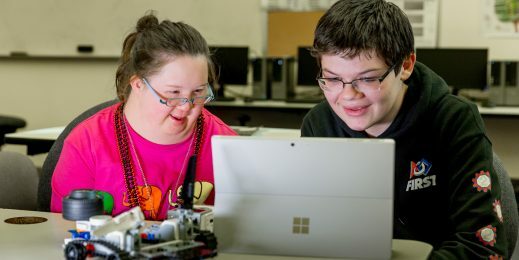 But one of the reasons she wanted to work for Microsoft, she says, was “because they are such strong corporate citizens.” When a nonprofit fair came to Microsoft and presented various options, Disabato found herself attracted to an organization known worldwide for helping communities. Through the Emerging Leaders program, she has volunteered at such places as North Helpline Emergency Services & Food Bank, Plymouth Housing Group’s Pat Williams apartments (assisting the homeless) and the Marra Farm Giving Garden (growing fresh, organic produce for local food banks). These days, she co-chairs the Emerging Leaders volunteer committee. Disabato considers the Employee Giving Program a powerful opportunity to help people who need it.